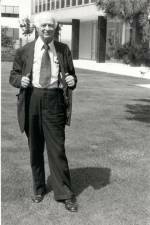 As Linus Pauling’s career progressed, his prominence, both within and outside of the scientific community, greatly increased. 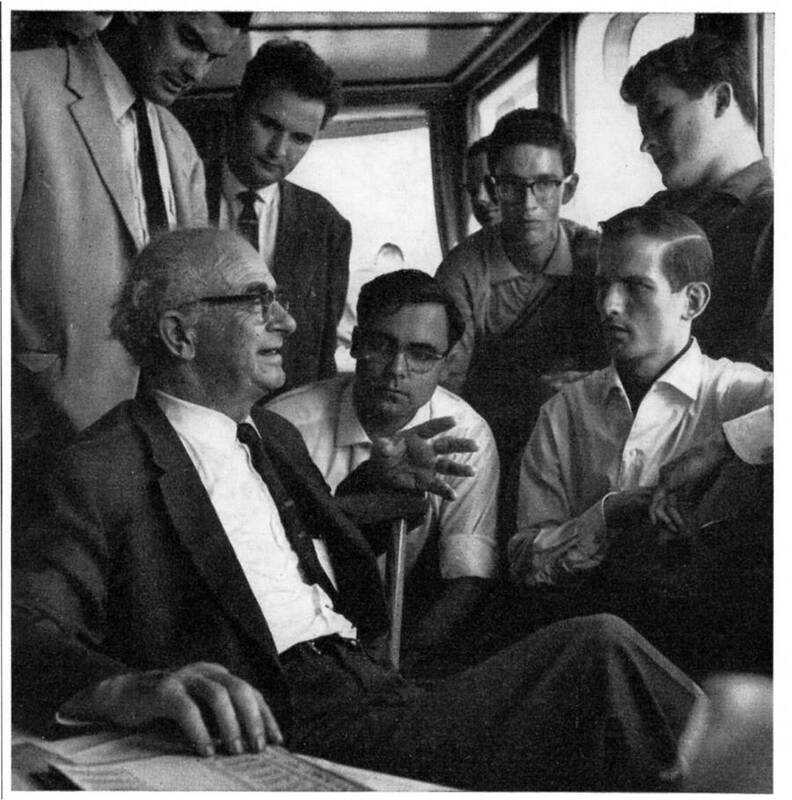 Because of this newfound fame and respect, the value placed on Pauling’s opinion also skyrocketed, and he was often contacted for his outlook on significant matters not directly related to his programs of research. This is readily apparent in the number of requests that he received to voice his thoughts on the fluoridation of drinking water. 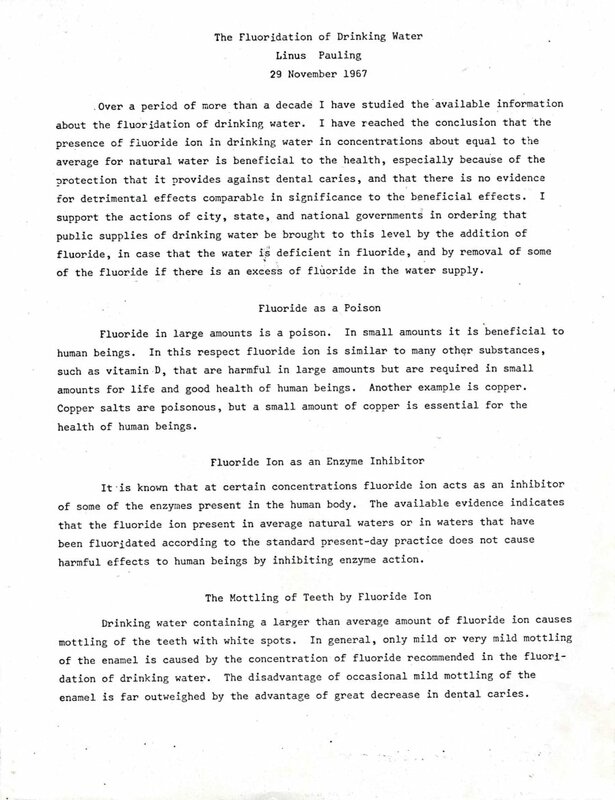 The addition of fluoride ion to drinking water to promote dental health became a very controversial topic in the second half of the twentieth century. Opponents of the process argued that fluorine, a powerful toxin in large enough quantities, can cause a number of health problems ranging from “mottled teeth” to drastic increases in cancer rates. Others called it a form of mass medication – a choice for the populace that the government should not have the ability to make. Natural waters differ in their content on fluoride ion. The average natural drinking water contains approximately the amount of fluoride that seems to be the best conducive to health, especially to the development of good teeth, and this action of fluoride is understood. Some drinking waters contain more fluoride ion, such as to cause mottling of teeth but no recognized damage to health. Some waters are deficient in fluoride ion. The addition of fluoride ion improves the quality of the drinking water, bringing it into the natural range that is most beneficial to human beings. Although some people have surmised that this small amount of fluoride ion might have some deleterious action, in addition to its beneficial action on the teeth, there is no evidence to support the surmise. Over a period of more than a decade I have studied the available information about the fluoridation of drinking water. I have reached the conclusion that the presence of fluoride ion in drinking water in concentrations about equal to the average for natural water is beneficial to the health, especially because of the protection it provides against dental caries, and that there is no evidence for the detrimental effects comparable in significance to the beneficial effects. For Pauling’s entire statement, see the scanned document below. Upon Linus Pauling’s death, the OSU Libraries Special Collections received approximately 500,000 of his and his wife’s personal items. Of this half-million item collection, a significant portion is comprised of his personal books which range from heavily academic texts to science fiction and murder mysteries. Amid the shelves of chemistry texts and genre fiction, however, there is a small subsection of books that has been known to draw attention from the Special Collections staff: the conspiracy texts. As evidenced by his lifelong devotion to scientific discovery, Linus Pauling possessed a deep interest in mystery and the unknown. It seems that, while most of his research revolved around academically sanctioned scientific problems, he occasionally spent his free time exploring more unorthodox subjects. As he aged and his devotion to pure science was tempered by his growing sense of social responsibility, Pauling began to expand his interests and become engaged in issues he had previously ignored. Beginning in 1963, Pauling took a position as fellow of the Center for the Study of Democratic Institutions, a think tank founded by Robert M. Hutchins as a part of the Fund for the Republic. The Center was known for its unusual and sometimes controversial activities, including proposing a new constitution for the United States and promoting radical political movements among students. For the first time in forty years, Pauling’s primary work had stepped out of the bounds of research-based science. The atmosphere at the Center allowed him to explore problems that his fellow scientists might have considered, at best, unorthodox. The JFK assassination had introduced Pauling to a whole new series of problems, where scientific fact could only go so far and the pitfalls of hoax and disinformation had to be carefully navigated. For years, he had played the role of the armchair gumshoe, reading countless murder mysteries, picking out clues and racing the protagonist to the revelation. As tragic as it was, the assassination had given Pauling a chance to apply his talents as an investigator to a problem beyond the sciences. The world of conspiracy and intrigue held an allure for Pauling that he could not deny. In the mid-1960s, Pauling began to take an interest in UFOs and extraterrestrial life forms. Between his longtime love of science fiction and the public focus on the development of the U.S. and Soviet space programs, spaceships and aliens seemed to be a logical point of focus for him. He quickly found that, for once, he was not at the forefront of a field of study. While he had been synthesizing proteins and teaching future chemists, the American public had become obsessed with the potential for life in space. The American UFO craze had begun in 1947 with an upswing in reported “flying saucer” sightings which resulted in a series of U.S. Air Force investigations (Projects Blue Book, Sign, and Grudge). 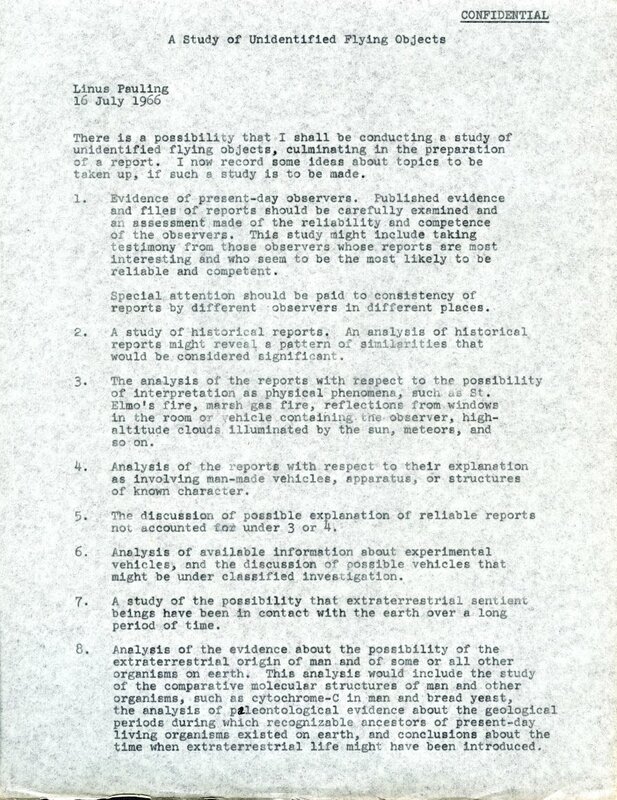 In 1952, the term “Unidentified Flying Object” was coined and, by 1956, several civilian research groups had formed, including the Aerial Phenomena Research Organization and the National investigations Committee on Aerial Phenomena. In order to understand what was going on in the world of UFO studies, Pauling did what came naturally. He began to read. While the ‘flying saucer’ section of the Pauling personal library is very small, it’s clear he was interested in the big picture, pulling from both scholarly and popular sources. One text, entitled NASA’s Space Science and Applications Program, is a well-worn report on NASA’s long term goals in space exploration and bioscience. 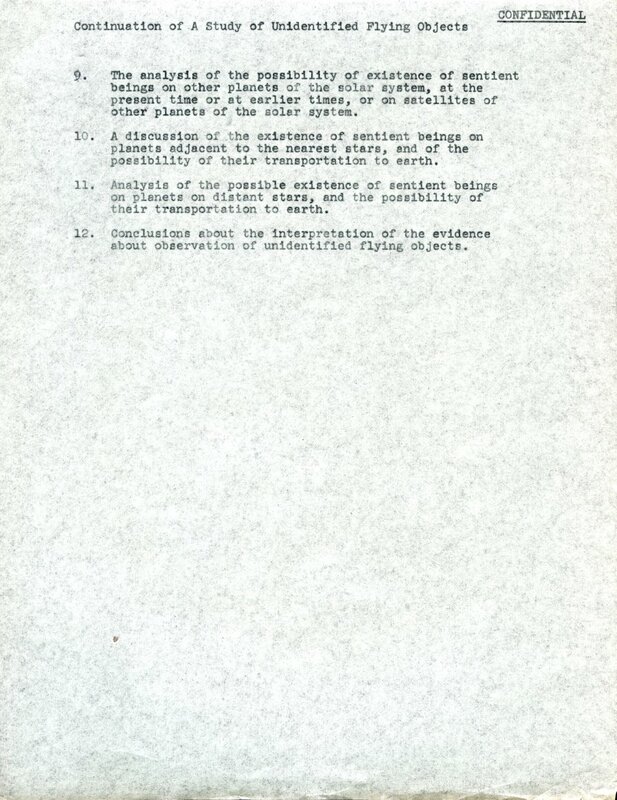 Another, The Scientific Study of Unidentified Flying Objects, is billed as “The complete report commissioned by the U.S. Air Force.” This volume, though lacking Pauling’s typical marginalia, sports heavy wear suggesting that it was a favorite. For more sensational reading, Pauling settled on the likes of Brinsley Trench’s The Flying Saucer Story and John G. Fuller’s Incident at Exeter. 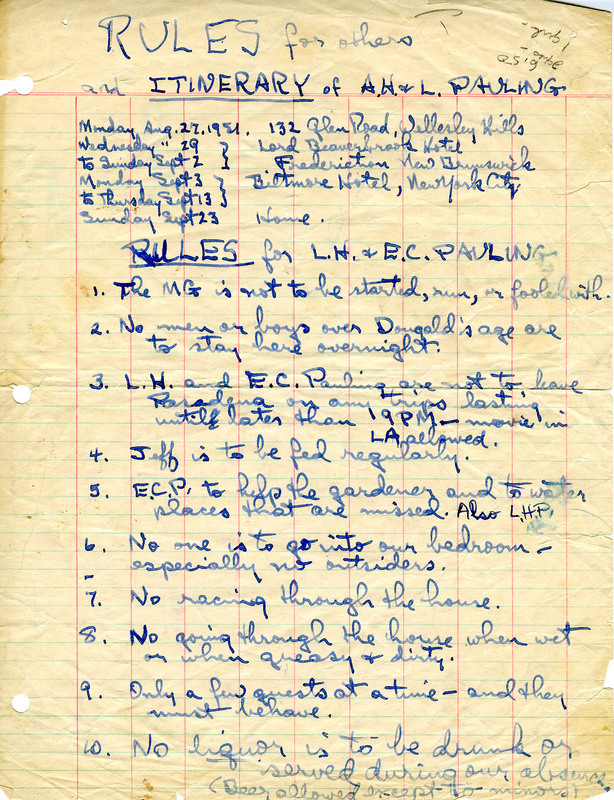 Pauling’s copy of Trench’s work is speckled with hastily scribbled questions, the word “check” next to underlined passages, and notes to contact a variety of scientists and officials. His margin comments belie a heavy skepticism suggesting that, despite his willingness to explore the unorthodox, Pauling maintained a strict logical outlook. As can be expected, claims that defied conventional science readily drew Pauling’s criticism. At one point, Trench claims “It [a UFO] could easily withstand temperatures at 15,000 degrees Fahrenheit, without showing any traces of melting.” A large question mark sits in the margin next to it as a testament to Pauling’s disbelief. It’s easy to imagine an aging Linus Pauling reading books about outer space and aliens in his free time, much as others read romance novels or tabloid newspapers. And certainly, his interest in the topic was primarily recreational, but it appears to have evolved over time. Pauling’s interest in UFOs peaked in 1966. He began preparing to formalize his research, going so far as to create a research proposal enumerating the requirements of an in-depth study on UFOs. As he became increasingly involved in the question of extraterrestrial sentience, his research became more and more intensive. When he had exhausted the available literature, he began contacting other academics for aid. 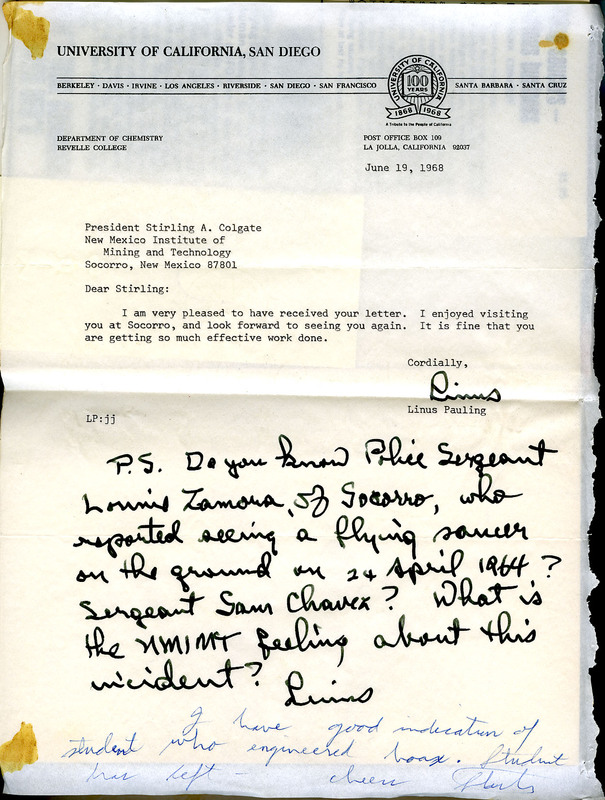 Set into his copy of Frank Edward’s Flying Saucers: Serious Business is a 1968 letter from Pauling to Sterling A. Colgate, president of the New Mexico Institute of Mining and Technology. In the letter, Pauling queries Colgate regarding a recent siting near the New Mexico campus, asking for information on the Institute’s official position regarding UFOs. By involving other researchers in his work, Pauling was taking a big step. He had announced that, despite public and scientific skepticism, he was willing to approach UFOs as a viable research topic and, more importantly, associate his name and reputation with that research. Unfortunately, Pauling’s UFO work never went very far. Following his receipt of the Nobel Peace Prize, he increased his efforts for nuclear disarmament, eventually pushing aside many of his lesser interests. By the 1970s, he was heavily involved in the promotion of orthomolecular medicine and the movement against the Vietnam War. Though we might imagine his interest in extraterrestrials continued, evidence suggests that his activist lifestyle left no room for further inquiry. For more information on Linus Pauling, please visit the Linus Pauling Online Portal or the OSU Special Collections website. This letter, posted by request, was written from Linus Pauling to Stirling A. Colgate on June 19, 1968. "Pauling's Weapon Against Swine Flu," San Francisco Chroncile, August 31, 1976. The current concern over the world-wide spread of swine flu virus brings to mind research that Dr. Linus Pauling conducted on this very subject, some thirty-three years ago. 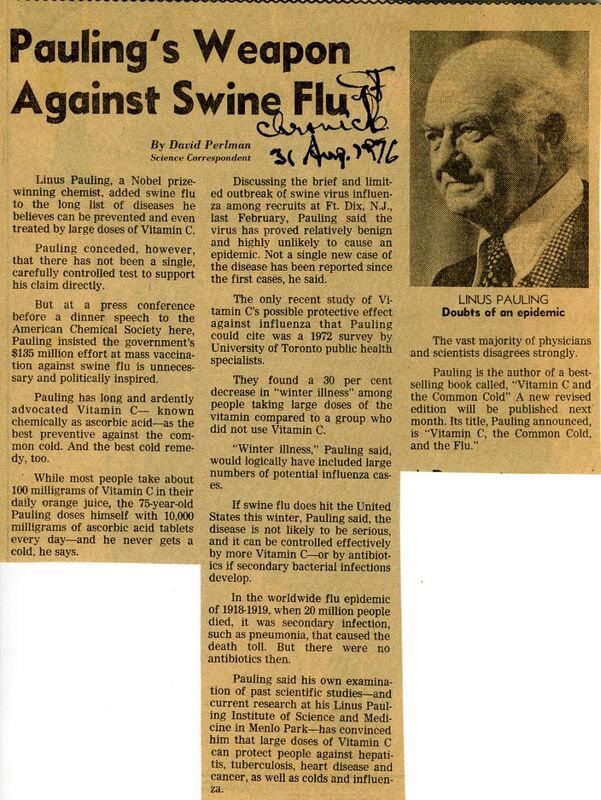 Pauling’s interest in swine flu seems to have been stoked by a convergence of two factors: 1) mounting fears over a potential swine flu epidemic that first emerged in the winter of 1976; and 2) his composition of the book Vitamin C, the Common Cold and the Flu, which was published in September, 1976. In the book – which was essentially a revised and updated version of Pauling’s massively-popular Vitamin C and the Common Cold, published in 1970 – Pauling chronicles the development of the swine flu concerns contemporary to his authorship of the 1976 volume. In February 1976 there was an outbreak of influenza in a large military establishment in Fort Dix, New Jersey. One young serviceman, exhausted by his participation in strenuous exercises, died of pneumonia. Typing of the virus showed that about 500 of the 12,000 persons in the camp had been infected by a swine-influenza virus, given the name A/NJ/76, whereas some others had been infected by another virus, A/Victoria/75, which was then sweeping over the United States and Europe. Although the virus A/NJ/76 seemed to have died out after infecting only 4 percent of the people in the camp, the resemblance of the virus to that of the 1918-1919 pandemic [referenced in the San Francisco Chronicle article above] and the death by pneumonia of one person after a strenuous night-time military exercise while he was suffering from swine flu caused fears that another swine-flu epidemic might occur in 1976-1977. President Ford announced in March that $135 million had been appropriated by the Federal Government to support the preparation of vaccine by pharmaceutical companies in an amount great enough to permit essentially all of the people in the United States to be vaccinated. In Pauling’s view, this approach was problematic on many levels. For one, the vaccines that were developed actually showed a tendency to make certain patients – especially children – sick. Partly as a result of this, the companies manufacturing the vaccines were not able to obtain proper insurance from private vendors and were forced to solicit protection from the federal government. More importantly, from Pauling’s vantage point, the threat posed by the 1976 swine flu outbreak was seemingly overblown. The question of how serious the threat of a pandemic really is has also been raised. During the last forty years the epidemics of influenza have shown remarkably little variation in their virulence. The high mortality in the 1918-1919 epidemic, especially among the younger adults, might have resulted from the malnutrition and other stresses at the end of a long war, causing the virus to be more than usually virulent and favoring the occurrence of secondary bacterial pneumonia. The facts that the infection in Fort Dix affected only 4 percent of the persons in the camp and that no other cases of swine flu have been reported since the Fort Dix outbreak lend support to the suggestion…that the Fort Dix episode may be an isolated occurrence. It now seems quite unlikely that there will be a swine-flu epidemic, and there is now little justification for recommending mass vaccination. I have advocated the use of Vitamin C in amounts of several grams per day to prevent or treat the common cold and other infectious diseases, including influenza, and I think that it may be of importance in relation to the expected epidemic of swine flu that people not be discouraged from making proper use of this valuable substance. 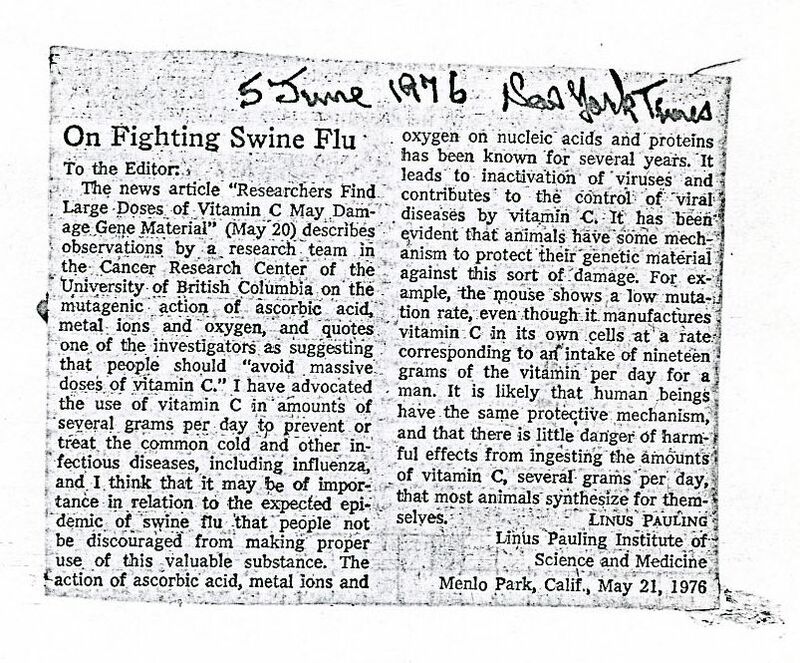 "On Fighting Swine Flu," Letter to the Editor of the New York Times, June 5, 1976. 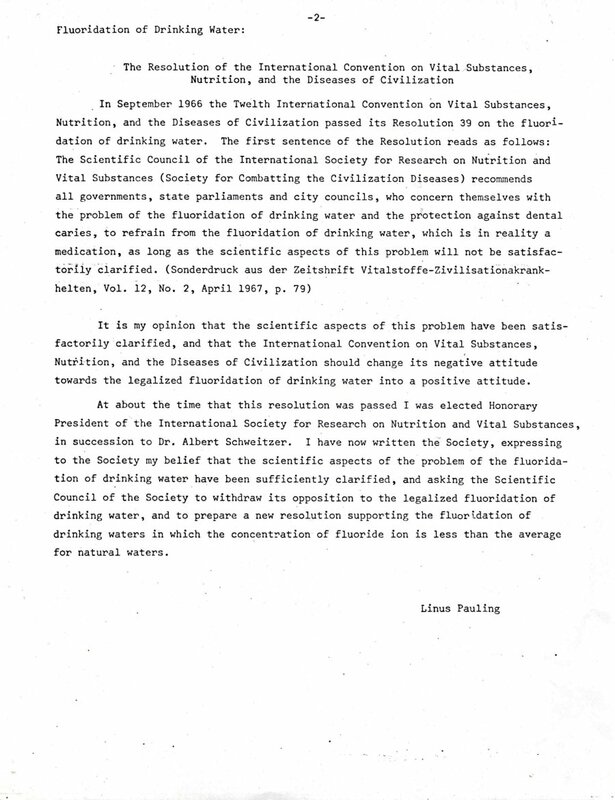 Again referring to Vitamin C, the Common Cold and the Flu, Pauling broadly suggests that a daily intake of between 250 to 4,000 milligrams of vitamin C, scaling up to as much as 10,000 milligrams per day – the amount that Pauling himself was taking in 1976, according to the San Francisco Chronicle article above – would decrease one’s chances of contracting a whole host of maladies, including influenza and the common cold. For more on the theory behind Pauling’s vitamin C advocacy, see “Orthomolecular Enhancement of Human Development” (pdf link), a speech that Pauling delivered in 1978 to the Institutes for Achievement of Human Potential. 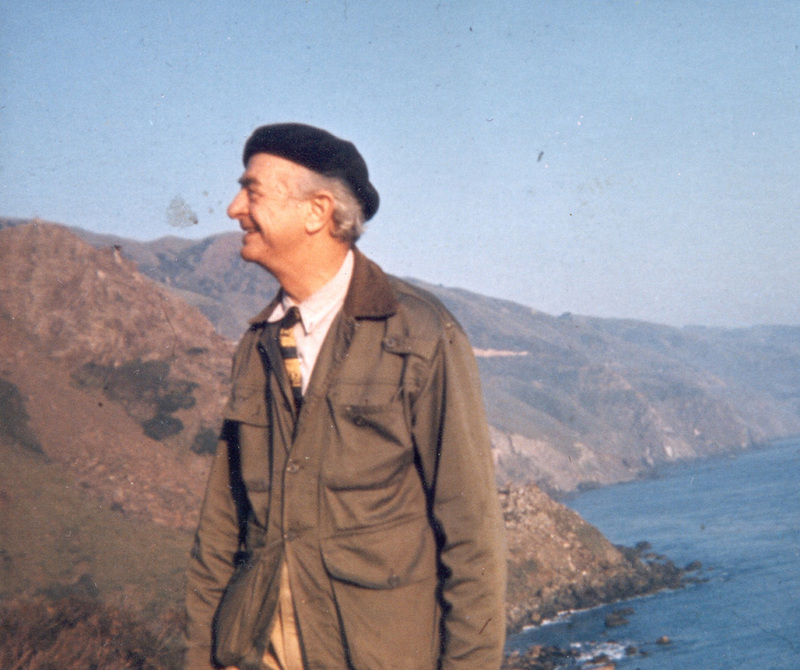 For more on Pauling’s life, work and legacy, see the Linus Pauling Online portal. 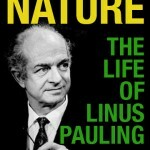 Much has been said about Linus Pauling as a student, scientist, researcher and activist. Here at the Pauling Blog, we’ve discussed his professional achievements in great deal and focused on key moments in his career and personal life. Despite all this, little attention has been given to Pauling as a father and a family man. Though the OSU Special Collections archives are filled with pictures, letters and memorabilia relating to the Pauling children, we have yet to thoroughly examine Pauling’s role as husband and father via the blog. In order to rectify this mistake, today we offer our readers a rare glimpse into the family life of Linus Pauling. This document is a 10-point set of rules, written by Pauling, outlining expectations for the children while Linus and Ava Helen were away on a trip. Be sure to note Pauling’s more humorous directions including his number one instruction—“The MG is not to be started, run, or fooled with.” Clearly, Pauling knew his priorities. When we find ourselves with a few spare moments, one of our favorite pastimes is conducting Google Blogsearch queries for the term “Linus Pauling.” Typically we come across a few of the more recent posts that we ourselves have published, catch up with the latest news from The Linus Pauling Quartet and sometimes unearth interesting bits of information that spur new ideas for the PaulingBlog. One does not have to search for too long, however, before finding one of three quotes that have spread rather dramatically across the internet. One of these quotes was definitely uttered by Pauling, but is often imperfectly reproduced. A second quote was actually published, but we have our doubts as to whether or not Pauling really did say it. The third quote, we and others feel, is likely a fabrication. Excerpt from a letter by David Harker to Linus Pauling, February 20, 1961. The first detail that pops out to us is that there is no citation provided for the quote. It’s pretty clear too, that the quote was not given by Pauling as an exclusive to Outrage! Moreover — and most importantly — it seems unlikely to us that Pauling would paint with such a clumsy brush in recounting his feelings about cancer research. The Mayo article is misleading and dishonest. It might be described as fraudulent. It purported to be a repetition of Dr. Cameron’s study, but it was greatly different, in a way that the Mayo Clinic investigators succeeded in hiding from the readers of their paper. Despite the great amount of money and effort expended in the study of cancer, progress during the last twenty-five years has been slow. A significant increase in survival time after diagnosis was achieved about thirty years ago, largely through improvements in the techniques of surgery and anesthesia. 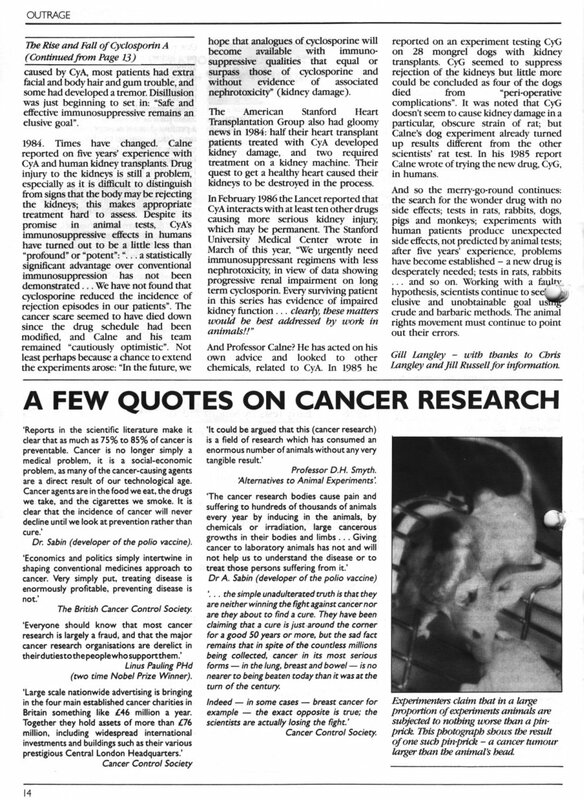 During the last twenty-five years some improvement in treatment of certain kinds of cancer has been achieved, mainly through the use of high-energy radiation and chemotherapy, but for most kinds of cancer there has been essentially no decrease in either incidence or length of time of survival after diagnosis, and it has become evident that some new ideas are needed, if greater control over this scourge is to be achieved. Critical? For sure. But hardly incendiary. None of this, of course, is proof that Pauling, in a fit of pique, didn’t one day lump most cancer research under the “Fraud” heading. Our feeling is that it is unlikely. But even if he did, the calmer and more balanced 1986 quote is surely more indicative of his true feelings on the matter. This one shows up on roughly 1,500 web pages and is uniformly uncited. Importantly, most of the 1,500 sites on which the text is used are attempting to sell a product. In the Spring/Summer 2003 edition of their newsletter, the Linus Pauling Institute staff directly addressed the dubious nature of these thoughts on minerals. A statement purportedly attributed to Linus Pauling has proliferated on the Internet, often in association with the sale of mineral supplements. The alleged quote is usually akin to “You can trace every sickness, every disease, and every ailment to a mineral deficiency.” We are reasonably certain that Pauling never made such a statement for the obvious reason that it is untrue. Pauling was interested in the health effects of micronutrients, especially vitamin C, the vitamin that absorbed his interest for almost thirty years. Throughout his career, Pauling used x-ray diffraction to elucidate the molecular structure of many inorganic substances, such as minerals, and organic substances like proteins. If he had been particularly interested in the health benefits of minerals, he would have focused his research in this direction. There is no evidence in the published literature that he did so. The essential minerals differ from the vitamins in that overdoses of minerals may be harmful. Do not increase your vitamin intake by taking a large number of vitamin-mineral tablets. Limit your mineral intake to the recommended amounts. We feel reasonably confident in our research on the items discussed in this post. However, if anyone can provide definitive proof for either the cancer research or minerals quotes, please do let us know and we’ll promise to devote a future blog post to further clarification of the matter. The conversation concerning the possible use of vitamin C in the treatment of cancer continues to gather momentum. As we’ve noted before on the PaulingBlog, the possibility that ascorbic acid might be a useful tool in the fight against cancer was a topic of intense interest to Linus Pauling and a handful of his colleagues (Ewan Cameron and Irwin Stone, among others) over the last two decades of his life. Pauling’s devotion to the subject, and often-fiery defenses of his beliefs, attracted no small amount of criticism from the scientific and medical mainstream. More than anything else, Pauling’s vitamin C and cancer research is the source of the “Pauling as quack” notions still prevalent in certain circles. -“Scientific Genius Dotes On Comic Strips, Miniskirts, But Can’t Cure Golfer’s Slice,” The (Portland) Oregonian, December 2, 1966. 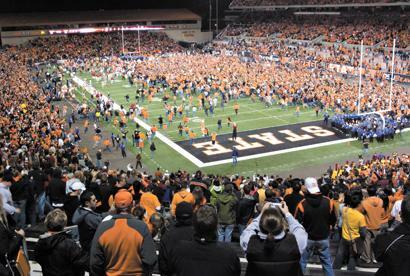 Fans storm the field at Reser Stadium following Oregon State's upset win over USC, September 25, 2008. Oregon State University’s remarkable college football victory over top-ranked USC last night has us thinking about a few entries in one of our more important documents — Linus Pauling’s Oregon Agricultural College diary, which dates to his freshman year as an undergraduate in 1917. The OAC Diary, which we’ve mentioned before on the PaulingBlog, is a terrifically-valuable resource in which the young Pauling records his thoughts and feelings in an honest and personal fashion. Both in content and in tone the document is quite different from most of Pauling’s later writings which, letters to Ava Helen excepted, tend to be rather formal. As one might expect, much of the diary documents Pauling’s process of assimilating into a new environment as an eager but unsure college freshman. 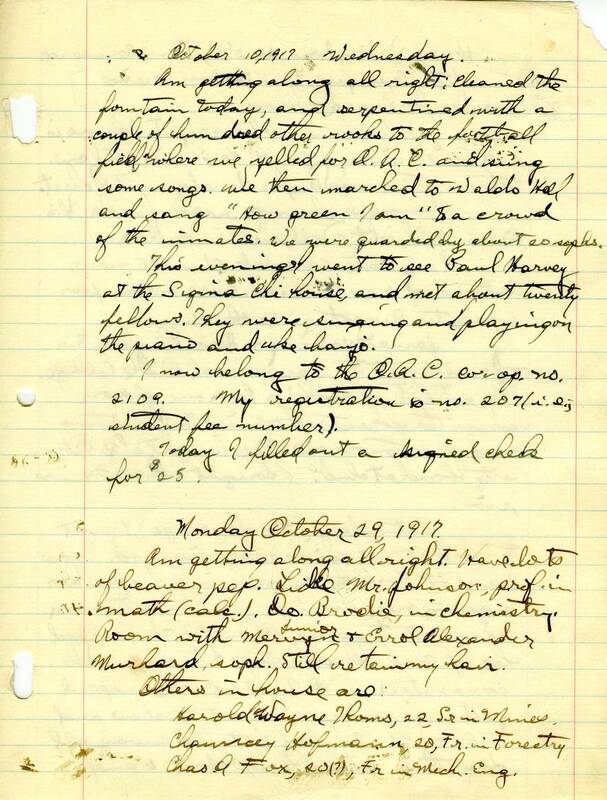 On page 54 of the journal, in an entry dated October 10, 1917, Pauling writes of an event that seems equal parts hazing ritual and spirit rally. Am getting along all right; cleaned the fountain today, and serpentined with a couple of hundred other rooks to the football field, where we yelled for O.A.C. and sung some songs. We then marched to Waldo Hall and sang ‘How green I am’ to a crowd of the inmates. We were guarded by about 20 sophs. Nearly three weeks later, on October 29, Pauling’s devotion to his new school seems to be strengthening. Am getting along all right. Have lots of beaver pep. Pauling OAC Diary, pg. 54. Pauling paid less attention to subjects outside the physical sciences, receiving…an F in his second semester of freshman gymnasium. He failed the gym class when, in true Pauling fashion, he tried to get around the rules. 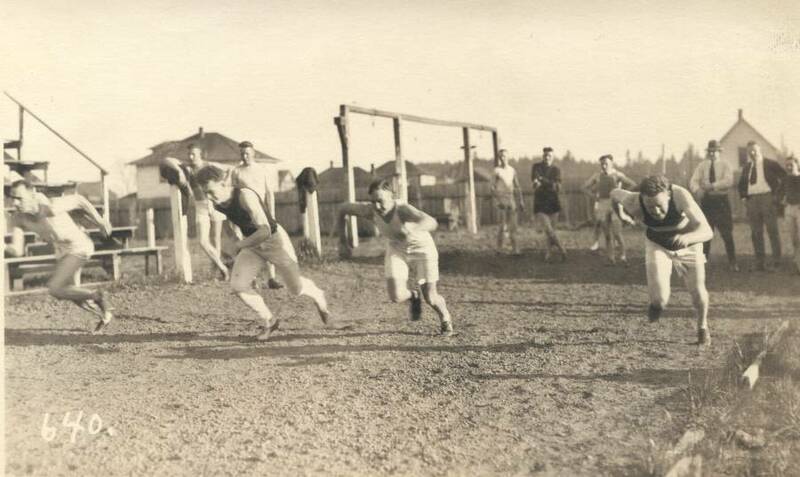 He knew that members of the school athletic teams weren’t required to take the standard gym classes, so he planned to join the track team instead of taking the required course. (He had thought about being a high-hurdles and high-jump competitor since high school.) Trying out for the team, however, was a disaster: He knocked over a hurdle and couldn’t clear a high enough bar to interest the coach. Although he ran in one meet, he failed to make the team, got an F in the course he tried to bypass, and gave up on competitive athletics. Linus Pauling (second from left), 1917.